BRYAN EATON/Staff photo. 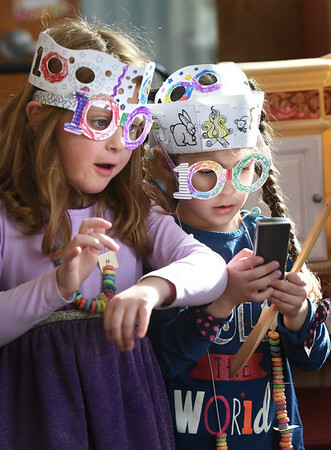 Maeve Goldson, 6, left, and Leila Allard, 5, make believe they have fancy watches while wearing their 100th Day of School costumes at Newbury Elementary School. The "100th Day Lady" came to the kindergarten classes where the kids made necklaces with 100 Fruit Loops, did counting excercises that added up to 100 then had a small party to celebrate.